Fans Flood Artist Ai Weiwei With Offers Of Legos : The Two-Way The Chinese artist says the Danish company that makes the toy bricks has refused to sell a bulk order for an exhibition on free speech. Ai says Lego is bowing to pressure from Chinese authorities. 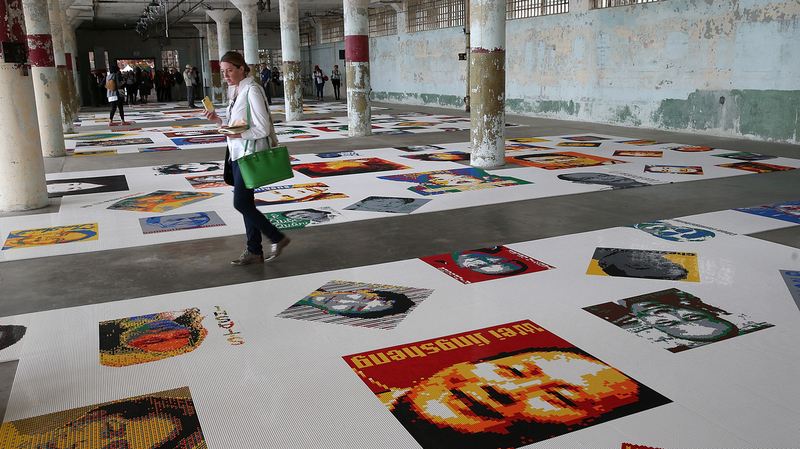 Visitors look at Ai Weiwei's "Trace" installation — part of the @Large: Ai Weiwei on Alcatraz series — last year on Alcatraz Island in the San Francisco Bay. The company that makes Legos has landed at the center of a social-media firestorm after Chinese artist Ai Weiwei complained that it refused to supply a bulk order of the toy bricks for his art. Ai said he wanted to use the bricks for an exhibition on free speech at Australia's National Gallery of Victoria. The museum attempted to place an order but was told by the company that it "cannot approve the use of Legos for political works." "We've been refused, and the reason is Lego will not support political art, which is very frustrating," Ai said in an interview with NPR. "As a powerful corporation, Lego is an influential cultural and political actor in the globalized economy with questionable values. Lego's refusal to sell its product to the artist is an act of censorship and discrimination." A free-speech advocate who was imprisoned by the Chinese government, Ai suggested that Lego was acting under pressure from authorities. The privately held Danish company recently announced that a Legoland theme park will open in Shanghai. "I think they just want to be safe, because they're expanding globally, and China is their biggest market," Ai said. In response, fans of the artist flooded Twitter and Instagram with offers of Legos, and Ai said he was setting up drop-off points for donations. He also posted a picture of Legos that had been left inside a car on a street in Berlin, where he is serving as a visiting professor at the University of the Arts. Ai told NPR that many of the people who have written to him are not professional artists, but understand the larger point he is trying to make. "They're not necessarily museum goers, but they understand what is the most important meaning of art, which is to really express yourself successfully and to really defend the essential values." "We acknowledge, that Lego bricks today are used globally by millions of fans, adults, children and artists as a creative medium to express their imagination and creativity in many different ways. Projects that are not endorsed or supported by the Lego group. "However, as a company dedicated to delivering great creative play experiences to children, we refrain — on a global level — from actively engaging in or endorsing the use of Lego bricks in projects or contexts of a political agenda. This principle is not new." " 'As China becomes more powerful, commercial organizations and national governments will become more well behaved and more scared to apply a double standard to China,' the commentary by Shan Renping read." This isn't the first time Ai has used Legos to make a political statement. Last year, he created mosaic portraits of people he called prisoners of conscience, including Edward Snowden and Nelson Mandela, on the floor of Alcatraz, the former prison in San Francisco Bay.